Oregon senator tells Yamhill County audience that he worries U.S. policies could lead to war with North Korea. 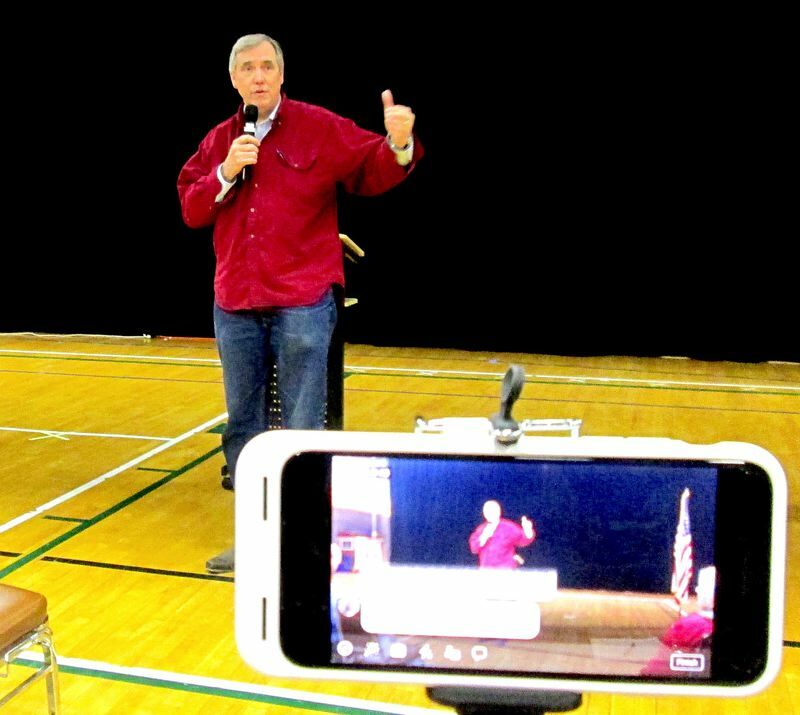 U.S. Sen. Jeff Merkley told a friendly Yamhill County audience Wednesday morning that recent trips to Central America and the southern U.S. border reinforced his belief that the nation's immigration policies were wrong and violated human dignity. 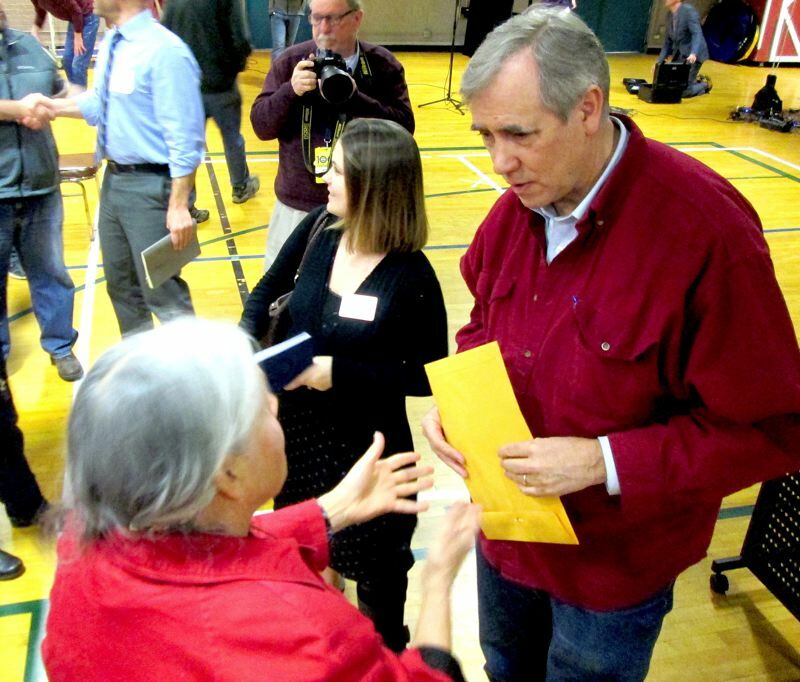 Merkley, a Portland Democrat and Oregon's junior U.S. senator, met with more than 200 people in McMinnville for about an hour March 20 to discuss issues ranging from tax cuts, the economy, the challenge of climate change, voting rights and gun violence. Most of the people were supportive of Merkley's political stands and applauded his responses to questions. Merkley spoke most passionately about U.S. immigration policies, which have left hundreds of Central American and Mexican people fleeing their countries in legal limbo at the border crossings. As a member of the Senate Foreign Relations Committee, Merkley recently toured the region and told the audience that he found immigrants who were stranded in Tijuana, Mexico, without support or resources for weeks, sometimes months, because they were awaiting asylum hearings. "Over the weekend, when I stopped to see people in the shelters (in Tijuana), I would sit down and say, 'What caused you to leave?' Merkley said. "They would get about four words into it and break into tears. Just horrific, horrific backgrounds." Merkley was among the first U.S. senators to call attention to the immigration problems piling up at the southern border. In June 2018, he tried to tour a Brownsville, Texas, juvenile detention center, where immigrant children were held, but was turned away. A video of the episode boosted Merkley as an advocate for immigration policy change. He has also slammed President Trump's border wall plan and called for a new way to handle unaccompanied children who cross the U.S. border illegally. Merkley was in Tijuana March 16 and 17, inspecting multiple shelters that are housing asylum-seekers who have been stopped at the U.S.-Mexico border. He also met with government officials and nongovernmental aid groups. In early March, when Merkley visited Guatemala, Honduras and El Salvador, he found "a really intense street gang culture that is very oppressive." Most people fleeing that violence were caught at the U.S. border is what Merkley described as a "Kafkaesque process that violates U.S. and international law." In most cases, immigrants can apply for asylum only after a "credible fear" hearing, which often aren't scheduled for weeks, leaving people stranded in Tijuana and northern Mexico, he said. Merkley said he wanted those people awaiting asylum hearings to be treated with dignity, the same way immigrants arriving 100 years ago were treated. "My argument has been that as people await their asylum hearings, treat people with respect and decency," Merkley told the audience. "We are a nation mostly of immigrants. We have a certain way that we would want our ancestors to be treated, so let's treat those people awaiting asylum with decency and respect." Asked about his frustration with the Trump administration, Merkley surprised some people by saying that he actually agreed with President Trump on a handful of issues, like "we have to find a way to stop sending manufacturing jobs overseas" and lowering the cost of prescription drugs. But Merkley said he was concerned about the direction of U.S. foreign policy and the administration's "embrace of dictators," and has discussed those issues with the Secretary of State Mike Pompeo. One major fear, however, is that the administration's policies could plunge the nation into war, he said. "I really hope we can get through the next two years without any new wars," Merkley told the audience. Merkley said Trump's overtures to North Korean leader Kim Jong Un, beginning with a "who has the bigger missile button" challenge, seem to be deflating, which could lead to renewed military tension on the Korean peninsula. "The president came close to starting to use military action against North Korea, but he flipped over to the bear-hug love-fest strategy," Merkley said. "Now he's embarrassed by that because North Korea continued to development their nuclear facilities while he was courting them. A lot of folks are concerned that they'll go back to a military strategy." If tensions flare, Merkley said he expected Congress to act on any possible military action.